While on vacation, sometimes it is good to have a plan of some sort. But then again, things change. The original plan for the day was to wake up and head straight back to Portland from Seaside. With glorious blue skies and temperatures in the mid-teens, we decided to stay and enjoy the beach. That we did, despite freezing our arses off. Once we were done with that, it was lunch time and gasp, we had no plan at all. So we had to do a random food adventure. 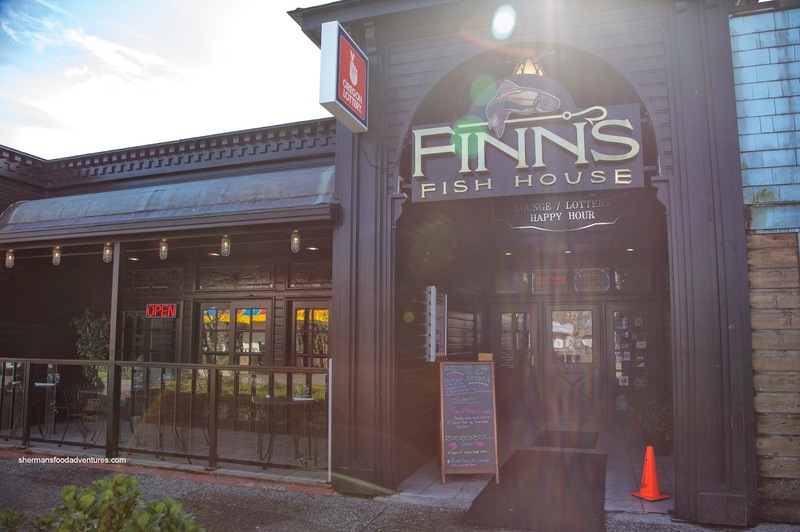 The first thing to catch our collective attention was the "kids eat free" banner at Finn's. Sold! To start, we had a bowl of the Clam Chowder with smoked salmon mainly because my daughter loves it. Yah, she often gets what she wants... I pity her future partner... Anyways, the chowder was super thick (probably a bit heavy with the flour or roux), yet arguably better in consistency than the watery version from Dooger's. 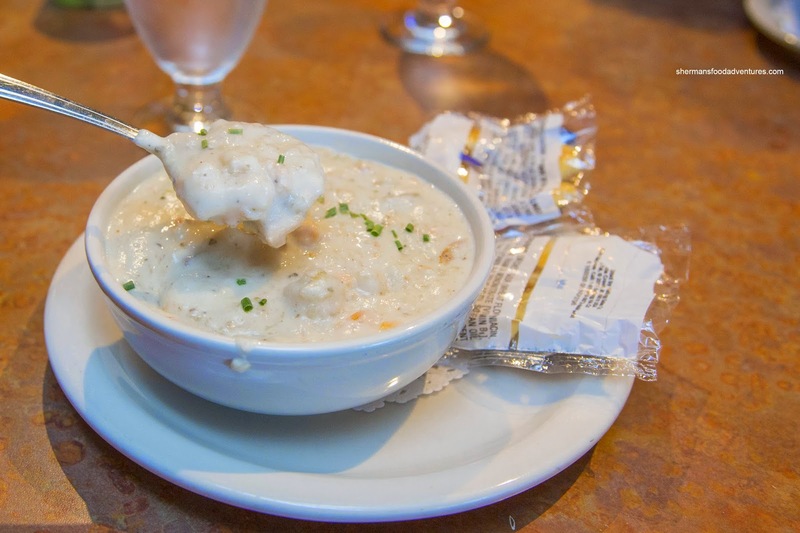 It was packed with tender chunks of potatoes, onions and clams with a touch of smoked salmon. It wasn't particularly creamy despite being thick while exhibiting a considerable amount of saltiness from the smoked salmon. 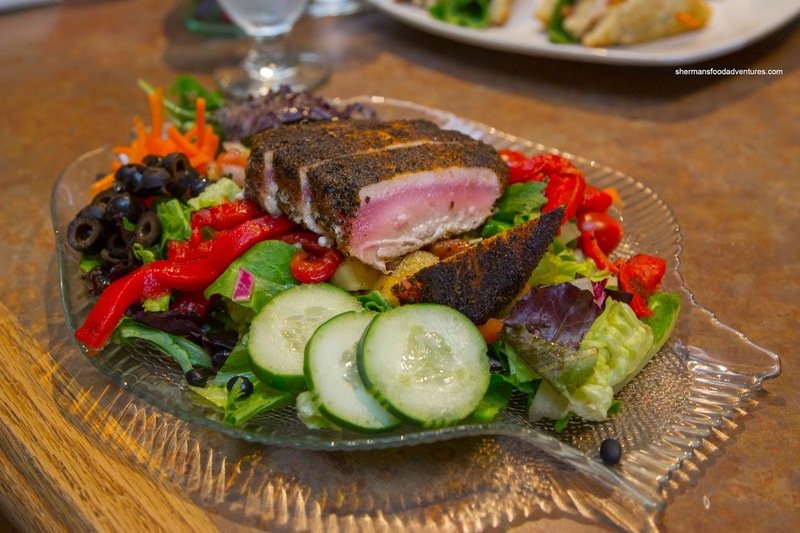 Trying to eat a bit healthier, Viv went for the Blackened Albacore Salad which featured a bevy of greens topped with a blackened piece of tuna. Unfortunately, the tuna was unevenly cooked where one part of it was fully done being dense and chewy. The salad was mostly fresh except for the radicchio. As for the cilantro lime dressing, it was nicely acidic while balanced off with a touch of sweetness and only a minor hint of the pungent cilantro. 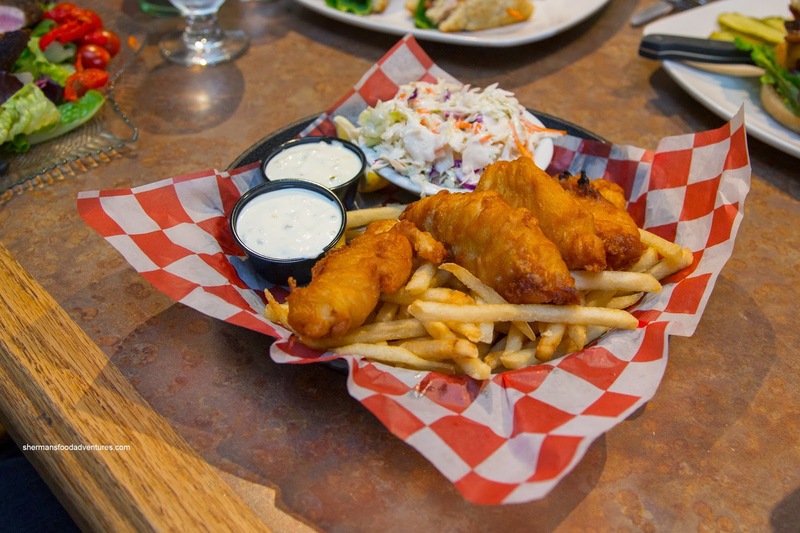 For myself, I had the 4 Piece Cod & Chips with coleslaw on the side. Although thin and crispy, I would've liked to see some fresh-cut fries instead of generic ones, but they were okay nonetheless. As for the fish, most pieces were flaky and moist with a super thin batter that was only slightly crisp. Tart and creamy, the tartar sauce was appreciably better than Dooger's sweetened mayo. I enjoyed the crunch of the coleslaw, but it was in dire need of more acidity, which I added myself in the form of lemon. 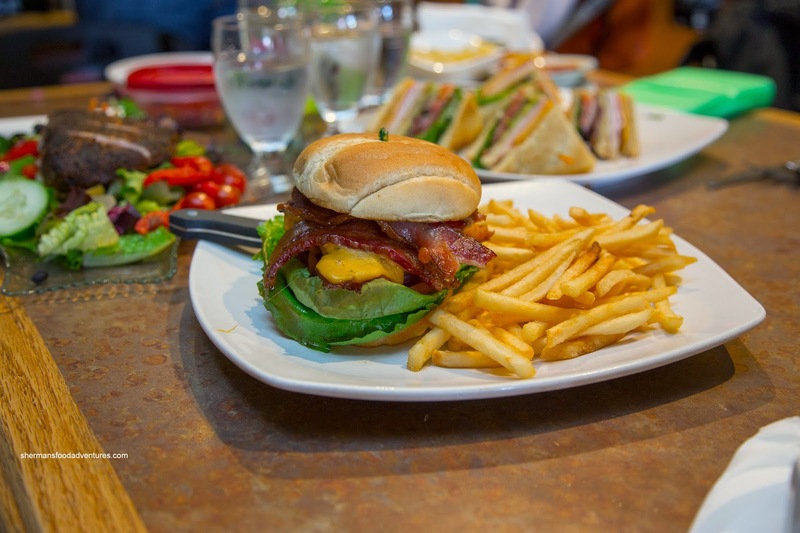 Girl Smiley opted for something similar but served within a bun being the Beer Battered Pacific Cod Burger accompanied by smoked bacon, cheddar, lettuce, tomato, onion and tartar. With the same qualities the aforementioned cod and accented by the other ingredients, this was a considerably-sized burger. Not sure if bacon went with this though. 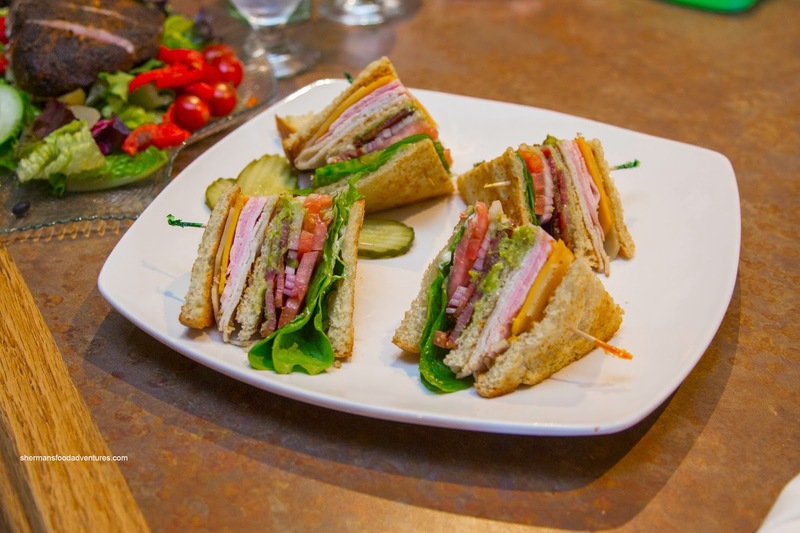 Guy Smiley decided on the ol' standby being the Club House Sandwich consisting of ham, turkey, smoked bacon, Swiss and American cheese, lettuce, onion, tomato, mayo and guacamole. This was another well-portioned dish which sported more filling than bread. He thought it was toasted a bit too much as it scraped the roof of his mouth. It was a decent sandwich though, but the addition of onion was strange as it dominated the flavour profile. Now the main reason why we ate here - the free children's meals! 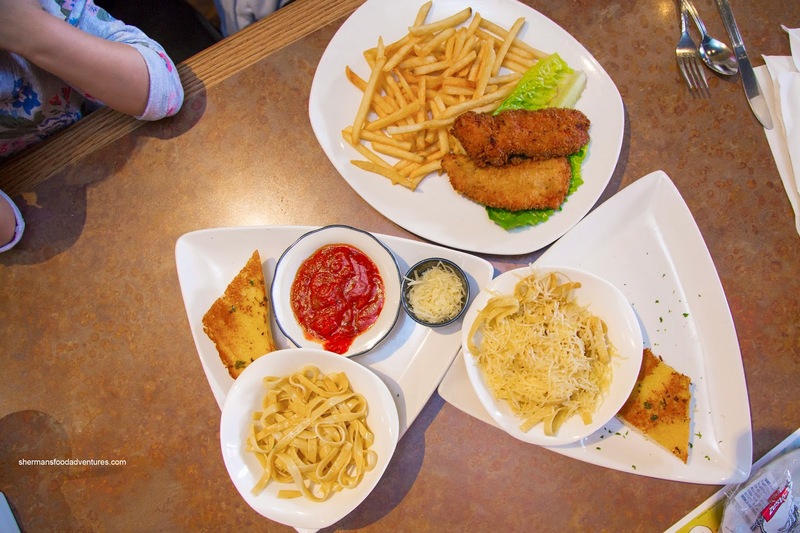 They had the Chicken Strips & Fries and the Fettuccine (in both marinara and butter & Parm). Pretty standard stuff, but hey, the dishes were no extra charge! That alone made Finn's a better value than Dooger's. In terms of the food, I would say both need a bit of work. If I had to choose, Finn's would edge Dooger's out.